19 British novels are among 142 titles that have been nominated by libraries worldwide for the €100,000 International IMPAC DUBLIN Literary Award. There has been three British winners of the award to date. Andrew Miller was awarded the prize in 1999 for his novel Ingenious Pain, Nicola Barker in 2000 for Wide Open and Jon McGregor in 2012 for Even the Dogs. Libraries in Birmingham, Liverpool, London and Newcastle were among the libraries in 39 countries worldwide who nominated books for the 2015 longlist. 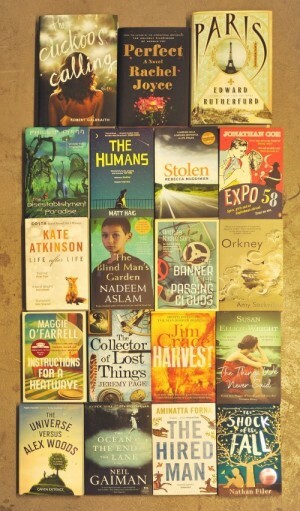 Also nominated were The Blind Man’s Garden by Nadeem Aslam, The Hired Man by Aminatta Forna and debut novel The Banner of the Passing Clouds by Anthea Nicholson. The complete list is below. The UK is also represented on the 2015 Judging Panel with Valentine Cunningham, Professor of English Language and Literature at Oxford University; Daniel Hahn translator, writer and editor, Chair of the Society of Authors, and UK-based Kate Pullinger (Canadian) winner of The Governor General’s Award for Fiction and Professor of Creative Writing and Digital Media at Bath Spa University, joining Jordi Soler (Mexico/Spain) and Irish novelist Christine Dwyer Hickey on the panel.